An unconference is a conference organized, structured and led by the people attending it. And we are having one at the PASS Business Analytics Conference! The Unconference is definitely not another Panel session. Unconferences facilitate greater exchange of ideas since we don’t have a defined schedule and there is certainly no PowerPoint! You are welcome to join us, participate in the discussion and please feel free to live blog and tweet the Unconference as you go along. Why attend the Unconference? Keeping with the Unconference style, the expertise distributed throughout the audience is greater than the expertise of the person who speaks at any one point. The Unconference is aimed at distributing the expertise, whilst also having fun! Join us to mix with your peers in the ultimate Business Analytics peer-to-peer learning, mixiing and talking creatively about whatever topics are decided on! Led by Denise McInerney, Data Engineer of Intuit, and myself, the agenda is created at the start of the evening. Anyone who wishes to initiate a discussion on a topic can claim a time and a space. Attendees are encouraged to share thoughts in open discussions with community-proposed topics. I hope you will use your ‘two feet’ and come and join us for the Unconference. Reserve your spot for this no-cost community activity – space is limited. Here is the link to register your place. This is open to PASS Business Analytics Conference attendees only, and takes place on Thursday, 8 May 2014 from 7:30 PM to 9:30 PM (PDT). If you haven’t registered for the PASS Business Analytics Conference, remember to use use code BASF2O for $150 discount! Whether you’re starting up an Analytics team in your organisation, there are more available positions than ever – and not enough people to fill them! 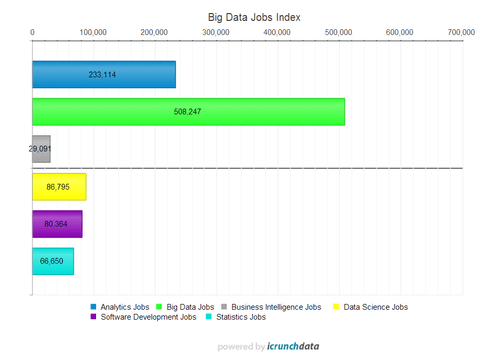 Todd Nevins, cofounder and director of marketing and media relations at job site icrunchdata, noted the site’s “Big Data Jobs Index” surpassed half a million last week. How do you get people with the skills to do analytics roles, given the skills shortage? How do you build loyalty whilst keeping up with demand for the Analytics skills? The skills are wide-ranging. Creativity, curiosity, communication, problem solving, maths, programming, stats, business experience…. How can you hire someone who has all of these? One route is to ‘grow your own’. Harness the enthusiasm in your team, and be the leader who leads, not the boss who drives. Attending the PASS BA Conference is one way to give your team members the experience of the diversity and breadth of Analytics, and expose them to a range of business and technical sessions which are geared towards the organic role of the Analytics professional. Oh, and if you are interested, quote this code above to get $150 off the price!